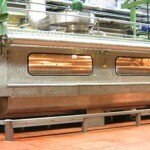 Drying is one of the most costly functions in any manufacturing process. Blistering occurs when drying water-based polymer systems. HeiQ ChemTex’ drying aids for latex compounds allow the use of increased drying temperatures to achieve proper cure without blistering. Thus drying efficiency is increased. The mechanism may also be applied to compounds in cases where blistering is not an issue. Faster machine speeds are achieved solely from the ability to dry the compound more efficiently. These products are designed for specific application requirements but are generally applied at 1-3% of the total compound. Typical efficiency increases range from 5-10% but have reached as high as 20%. CHEMTEX NBP, NBSS-2, NBSS-13: Specialty systems designed to aid drying in various coating applications to prevent film deterioration. Contact HeiQ ChemTex for more information about our drying aids for latex carpet backing.